ON TOUR takes a different slant this week, the tour in question being round a kitchen – but not just any kitchen. With inflight food a constant source of comment among passengers, BTN’s Richard Cawthorne took up an invitation from Delta Air Lines to check out one of the airline’s main suppliers, Gate Gourmet, at its complex near Heathrow. Inflight eating may not generally enjoy a good press, but things are improving fast as airlines start to take it more seriously, especially in the premium cabins. One such is Delta, which is engaged in a continuous programme to upgrade things. At the end of last year, passengers flying in the Delta One cabin on trans-oceanic flights across the airline’s network were treated to new seasonal menus featuring ingredients sourced from artisan, small-batch producers – now a spring menu has just been introduced. It followed Delta’s move to offer more chef-created menus in flight, in pursuit of which it signed up Danny Meyer’s Union Square Hospitality Group of New York to start the ball rolling. Others involved include Carmen Quagliata of the Union Square Cafe in NY and Linton Hopkins from Atlanta. 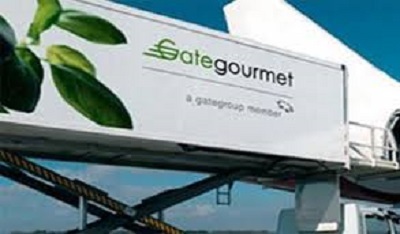 Another key ingredient in the Delta programme is its relationship with Gate Gourmet, the worldwide inflight-catering specialist whose loading vehicles are a familiar sight at aircraft doors before takeoff and where head chef Paul Kight also plays a leading role in the new aproach. The company produces 250m meals for its long list of airline clients every year, of which more than 600,000 a year are made at its facility near Heathrow for customers flying in the Delta One cabin. Gate Gourmet holds enough produce on site for more than 40 flights, and it is used and replenished at least once a day. Delta’s links with Gate Gourmet extend beyond the careering giant’s London base to 45 destinations, which produce more than half the airline’s meals across the world. Although smaller than the kitchens close to Delta’s US hubs, the Gate Gourmet team still faces the same procedures and pressures to get every meal to every flight safely and on time. The big surprise when you enter Gate Gourmet’s London premises is how calm the kitchens are. Granted there’s a lot going on, given it’s not only Delta’s 10 daily flights the kitchens are catering to but a raft of other airlines as well. Delta’s meals are made in the evening ready for loading on to flights during the 1hr 45min turnaround time each aircraft has at Heathrow. But unlike many kitchens we have known, the process is streamlined enough so there is no sign of shouting and screaming. Cool, calm and extremely organised was closer to the mark, at least on the day of BTN’s visit. As you would expect, it’s a highly-controlled environment inside the kitchens to ensure the safety and freshness of the dishes. The food is placed in cold stores, then loaded on the carts with a label placed on each so flight attendants know what is inside and where on the aircraft it should be loaded. Cabin staff also receive cooking and plating instructions to ensure each dish is as near to restaurant quality as possible in aircraft conditions. Special considerations having a bearing on what can be served include the fact that in the ground kitchen, hygiene rules dictate food must be cooked to 75deg C, but on board aircraft, ovens need to be heated to 160C. Beef must be cooked on-board for 22min, and fish for 18. On international flights, Delta One customers are offered a welcome drink on arrival – sparkling wine, mimosa, beer or orange juice – with full service starting with an appetiser and drink after takeoff. This is followed by a starter and soup course from the trolley before a passenger’s choice of entrée is served direct from the kitchen. Each flight has four options, including a vegetarian dish. Choices during my tour of the Gate Gourmet operation included beef tenderloin with gratin potatoes and sautéed spinach, roast cod with saffron tomato sauce and five-cheese ravioli with arrabiata sauce. The meal is rounded off with a choice of dessert, fruit and cheese or Delta’s noted ice cream sundae, accompanied by tea, coffee or liqueur. About 90 minutes before landing, the second service begins. Like all Delta menus, the selection change four times a year - recent selections included lobster mini-rolls or mixed-greens salad with grilled salmon and pita chips. The decision on what to include on menus begins with twice-yearly chef demonstrations, along the lines of MasterChef in the UK or Australia’s My Kitchen Rules, with each contender presenting proposed dishes and Delta’s culinary team judging whether they will be a hit inflight. To top it all off, once the menus are chosen, Delta’s master sommelier Andrea Robinson tastes more than 1,600 wines each year to pair with the dishes. Each flight has a choice of two white, two red, a champagne and dessert wine and once short-listed each is tasted on board to see if it can hold up at altitude. A very interesting and revealing article.